Tidligere i sommer viste Dagbladet Vanity Fair-bildene av Mette-Marit og Haakon, men Märtha og Ari foran Kongsseteren - sittende på reinskinn i lusekofter - vekker nok enda mer oppsikt. Vanligvis er vi nemlig vant til å se forfatteren og eventyrprinsessen i langt mer trendy omgivelser. Bildene ble tatt 20. februar, og inngår i Vanity Fairs jubileumsutgave. Magasinet, som nå er på gata i USA og Europa, har fotografert en rekke av de mest kjente unge kongelige i Europa - deriblant prins William av Wales, kronprins Felipe av Spania og kronprinsesse Victoria av Sverige. Fotografen valgte en urnorsk setting for Märtha og Ari, og dermed tok han ikke særlig hensyn til Norges Turistråd. De skulle nemlig ønske at Märtha og Ari stilte i en annen positur - ettersom bildet i Vanity Fair bidrar til å befeste stereotypiene om Norge. - Jeg har ikke sett bildet, men kan gladelig forestille meg det. Et slikt bilde gir ikke de rette signalene til dem vi vil være attraktive for - nemlig moderne reisende. Norge har mange spennende elementer som er langt viktigere enn lusekofter og vinterhytter, sier viseadministrerende direktør Børre Berglund i Turistrådet. - Så dette passer ikke med strategien deres? - Märtha og Ari er flotte representanter for Norge, men dette fotografiet bidrar til å bekrefte bildet mange har av Norge. Og det bildet trenger vi å nyansere, sier Berg-lund. Vanity Fair inneholder vanligvis en blanding av underholdning, politikk og kultur, og har et opplag på 1,1 million. Det gjør at magasinet har et enormt nedslagsfelt. Berglund understreker at leserne av bladet trolig har lite kunnskap om Norge fra før, og at det således ville vært ideelt å plassere Märtha og Ari i en annen setting. - Aller helst ville jeg hatt dem i en actionfylt snøaktivitet - i alpinbakken eller langrennssporet, med storslått og uberørt natur i bakgrunnen, sier Børre Berglund. - Prinsesse Märtha Louise og Ari Behn sa ja til en forespørsel fra Vanity Fair sammen med en rekke andre kongelige i Europa, sier Gjeruldsen. Han ønsker ikke å kommentere selve bildet. The Norwegian Tourist Board is really NOT pleased at all with the picture in VF of Pr. Märtha Louise & Ari Behn. It &#39;confirms a stereotype kind of picture of Norway&#39; and &#39;they had hoped both the Princess & her husband (seen as excellent representatives for their country&#33 might have been pictured &#39;in action&#39; and not like this. Princess Martha Louise and her husband Ari Behn are reportedly bidding on a suburban estate in a valley west of Oslo. The asking price is NOK 9 million (USD 1.2 million), with King Harald probably ready to come up with the money. Neither the princess nor her husband has the income or savings necessary to make such a large purchase. King Harald already has invested in property on behalf of his children, buying a flat for his son Crown Prince Haakon a few years ago. Now it seems he&#39;s willing to make another generous gift. It&#39;s already been reported that he and Queen Sonja have inspected the property that Princess Martha Louise and her husband first fell for last year. It&#39;s a country estate in suburban Lommedalen that borders on the forest known as Baerumsmarka. It consists of a main house and two smaller houses plus a stall for horses situated on a large parcel of land that&#39;s well-hidden from public view. Real estate broker Lars M Saether told wire service NTB on Wednesday that two parties are now bidding on the property. He expected a deal would be struck within the next few weeks. The current owner, Anne Karoline Smestad Geelmuyden, also confirmed that negotiations were underway. The royal palace had no comment. The princess, her husband and baby daughter Maud Angelica have continued to live in the Oslo flat that the princess inherited from Queen Sonja&#39;s late mother. This is the house in the Oslo suburb of Lommedalen that Princess Martha Louise and her husband Ari Behn want to buy. I read that Princess Martha Louise and her husband Ari Behn were successful, and now own it. What happened to Martha Louise and Ari&#39;s planned move to New York City? Now that they&#39;ve bought a place in suburban Oslo, it seems that they are settling down? How about, if Mette-Marit hadn&#39;t become pregnant, then Martha Louise and Ari would have moved to NYC to escape the lime-light? Princess Martha Louise is clearly upset over reports that she borrowed NOK 6 million to buy her dream house in suburban Oslo. Palace staff is demanding that a local magazine retract claims that she's a gjeldsslave, literally a "debt slave." The Norwegian Palace demands an official apology from the magazine Se og Hør after an article stated that Norwegian princess Märtha Louise took out a large loan to buy her dream house. when will they move in to their new house? Princess Martha Louise, her husband Ari Behn and baby daughter moved Monday to a new large home in suburban Baerum. In doing so, they&#39;ve swapped an urban lifestyle for one in the country. Their new address is Burudveien 63 in the area known as Lommedalen, which literally means "the pocket valley." Their new home is a rural estate encompassing a large two-story main house, a guest house and even a children&#39;s playhouse. The couple paid NOK 8.8 million for the property last fall but had intended to move to New York for a few years. They postponed those plans when it became known that the princess&#39; brother, Crown Prince Haakon, and his wife were expecting the new royal heir in January. Then Princess Martha Louise&#39;s father, King Harald, was diagnosed with cancer, so the move to New York remains postponed indefinitely. 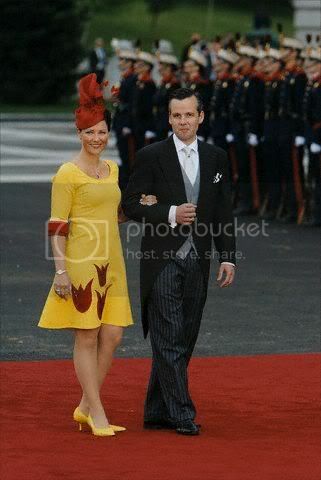 Meanwhile, they went ahead with the move to their new house, confirms Wenche Rasch, a spokesperson for the Royal Palace. "They moved Monday and now live in Lommedalen in Baerum on a permanent basis," Rasch told news bureau NTB. The princess, Behn and their baby daughter Maud Angelica have been living in the flat on Professor Dahls Gate in Oslo that the princess inherited from her grandmother. - keep it empty for a few years, until Maud grows into it? This isn&#39;t something I&#39;m 100% sure of, but it&#39;s one of those things I&#39;ve read somewhere, but can&#39;t remember where. It&#39;s nice that there&#39;s a family place that&#39;s kind of up for grabs, in case anyone needs a temporary place to stay. I believe it is the Queen&#39;s brother, Haakon Haraldsen, who owns the appartment building in which this flat is situated. He probably retained the flat all along, and rented it out to his niece. BTW .... along a different subject .... how are they doing with that new house of their&#39;s? Probably fine. Haven&#39;t heard much of anything, except that they live there, but plan to move to New York in the fall. Märtha's yellow dress at Felipe and Letizia's wedding. http://www.vg.no/bilder/bildarkiv/1085145855.24817.jpg What was with her hair?